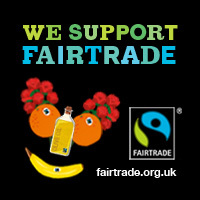 Last year I signed a letter for a campaigner asking major tea manufacturers to make their products Fairtrade. That prompted me to take a look at the tea I drink, only to find there wasn’t a Fairtrade version being sold in Witney. I wasn’t keen on moving to a different type of tea in bags, but luckily for me and the tea-pickers, the campaigning paid off and packets of Waitrose Darjeeling now sport the Fairtrade symbol. Even more impressive has been the campaigning work of the local Fair Trade Action Group WAFTAG. For the past three years it’s never been clear exactly what it is about Fairtrade that would be unfair to Witney, and that in itself has made countering the objections an almost impossible task. It got quite heated at times – who could forget the local County Councillor branding some of the most gentle, thoughtful people in our community as the “Fairtrade Stasi”? And despite the support of some town councillors in private, and even from the prime minister himself, as a whole, the Town Council remained steadfastly opposed to giving its approval for Witney to gain Fairtrade status. But eventually, just like my cup of Fairtrade tea, the campaigning has paid off. Last week the Town Council approved the minutes of the General Purposes Committee which contained a carefully negotiated statement enabling WAFTAG to apply for Fairtrade Town status. Just in time for the elections next month, we can finally say thank you to the Town Council for allowing Fairtrade status to go ahead for Witney. The success of this movement’s philosophy, that people deserve a fair deal and shouldn’t be ruthlessly taken advantage of by the big players, is encouraging. The fact that something as simple as a label representing a fair deal can affect our behaviour and our notion of what is “value for money” is powerful. Supermarkets are some of the biggest players in our everyday food chain. As we know, everything they do, they do for us. They know what we want and they give it to us in the most efficient way they can. When I pick up a bottle of milk in the supermarket, the manager doesn’t need to ask me whether I’d like to reduce the contract price to the farmer by 6% year on year regardless of his fluctuating costs. He doesn’t need to ask whether I’m concerned the farmer might resort to suicide because he can’t face the humiliation of losing his family’s business – he just knows I’d rather have the milk shipped in from France where there’s a better deal to be had. As a single consuming unit, he knows I’m only interested in making the most advantageous transaction for my, and his company’s, pocket. But what if it had a ‘Local Fairtrade’ label? This entry was posted in Sustainable Witney and tagged politics, words on Sun 3 Apr 2011 by kevin hickman.